In preparation for starting the motor, I changed its plugs and oil, checked the points and ensured that it does turn over freely. Still not ready to fire it up though. I removed the fuel tank and sent it to Mo-Bros to be cleaned and sealed. They have done several of these for me in the last few years. Unfortunately, I think they succumed to the weak economy as their web page is no longer found. 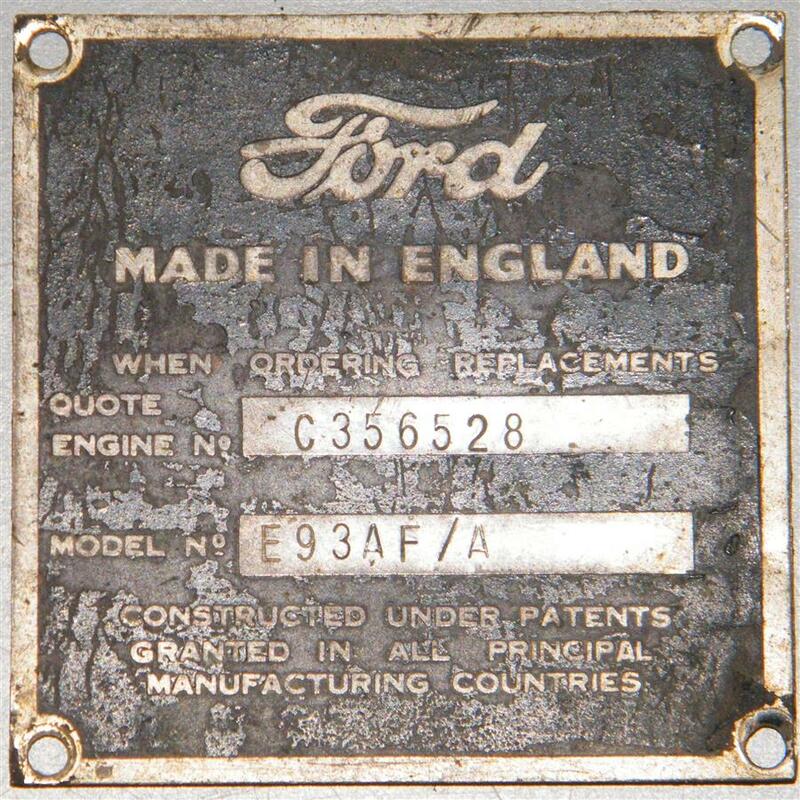 Shame that as they built really nice street rods. 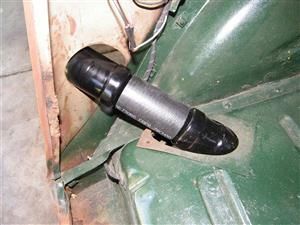 The filler neck always had a large dent where apparently it was force fit during addition of the boot extention. It still did not fit the body opening properly. I tried with a long pry bar to bend it just a bit to better fit the opening. Too late, I discovered that the neck was soldered to the tank instead of welded. I separated the joint. I solved both problems by rebuilding the neck. First I cut out the bent section in the center to replace it with a hose. But at 2-7/16 inch diameter, hoses are not available. I got two exhaust pipe 2 to 2-1/2 inch adapters and attached them to the cut ends with epoxy. 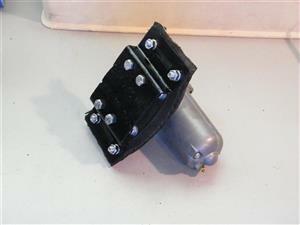 Then I resoldered the neck to the tank flange and attached the ends together with a standard 2 inch fuel filler hose. The result is that the filler now fits the body opening perfectly and the hose allows for a small adjustment if necessary. The hose clamps are not shown in this photo. 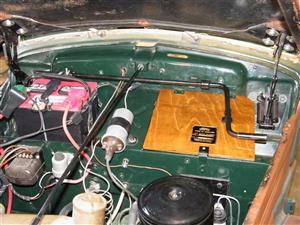 The next fuel related step was to install the auxiliary electric fuel pump and filter. 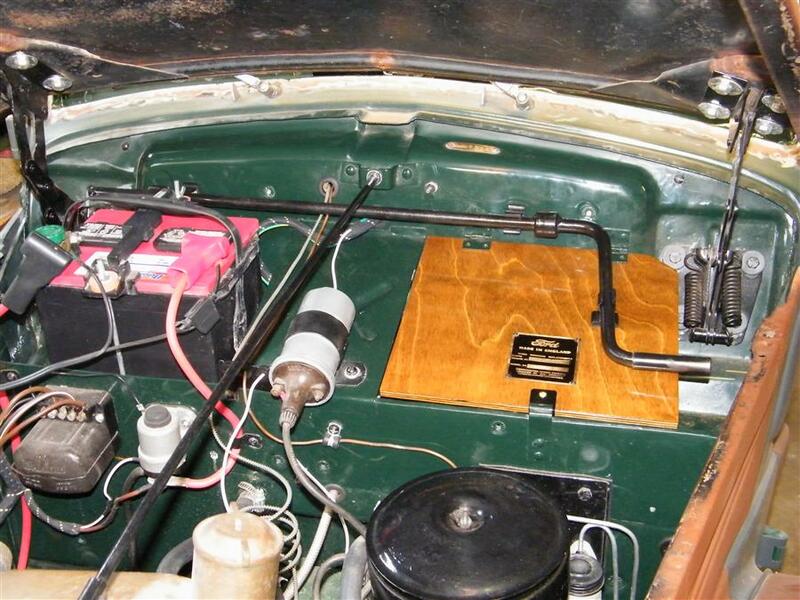 If the car sits for a few days, it takes a fair amount of cranking for the mechanical fuel pump to fill the float bowl. To alleviate this, I purchased an electric pump to be mounted near the tank and used only to fill the float bowl before starting. The two-position starter switch cannot be operated while in the fuel pump position. On the left is the pump with its mount made from a couple pieces of steel and part of an old tire. The other is the pump and filter installed in a protected area just behind the tank. The copper line is the pump outlet going into the chassis rail on its way to the engine bay. Although it is in theory ready to start, I don't want any fuel in the tank yet. It will likely be months before I am actually able to run it enough to use the fuel and the tank drain has been epoxied or welder into the tank. I have never been able to remove it so the only way to drain the tank is remove it and turn it upside down to pour out the filler neck. Before going to the All British Car Show, I completely rebuilt the brake and clutch hydraulics, to include new wheel cylinders and brass sleeves for the clutch slave and both masters. That was several years ago. Next I wanted to drain and replace all the fluids. The brake pedal still worked but I'm not sure I tried the clutch. My plan was to pump the fluid through while keeping the masters full until clean fluid came out at all the slaves. Anyway, I opened a wheel cylinder and Judy pushed the pedal to the floor. The fluid that came out was darker than I expected since it probably had fewer than 50 miles although several years on it. As it turned out, The pedal remained on the floor when she lifted her foot. The piston was stuck at the end of the cylinder due to gummed fluid and maybe even some deteriorated rubber. That meant a complete overhaul or replacement of all cylinders. In fact, they all cleaned up fine. Even the rubbers still looked good but I elected to kit all of them just to be safe. 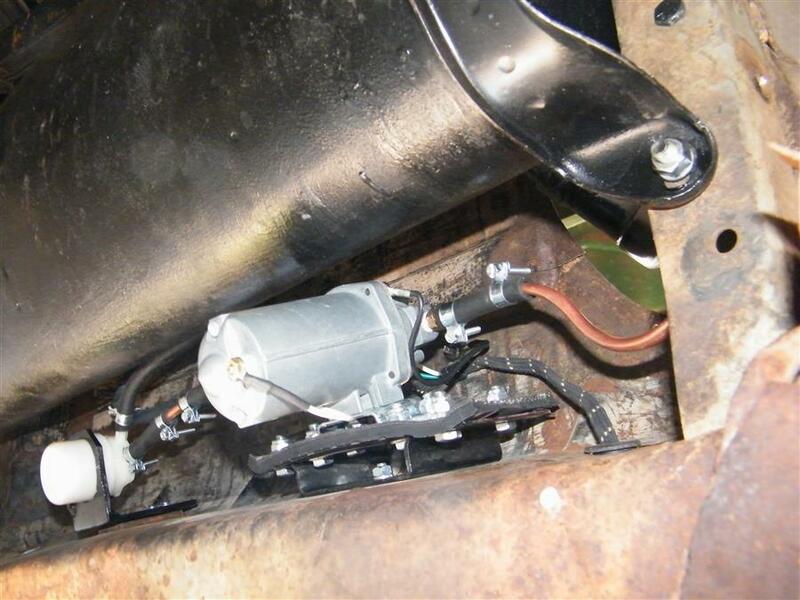 I purchased kits for everything from Kip Motor company and rebuilt all. The pistons for the rear cylinders must have been something non-standard as the new rubbers would not fit. I could have turned them down on a lathe but decided on new cylinders instead. The brakes came back to life as expected. The clutch was not to be so simple. Way back when I converted it to hydraulic, I used the actuating rod from the slave cylinder and just bent the end about 90 degrees to engage a hole I drilled in the lever that operates the release bearing. Then I cut a plate and mounted the cylinder on a chassis rail. The whole thing looked like something built with a hammer and pliers by a rank beginner. 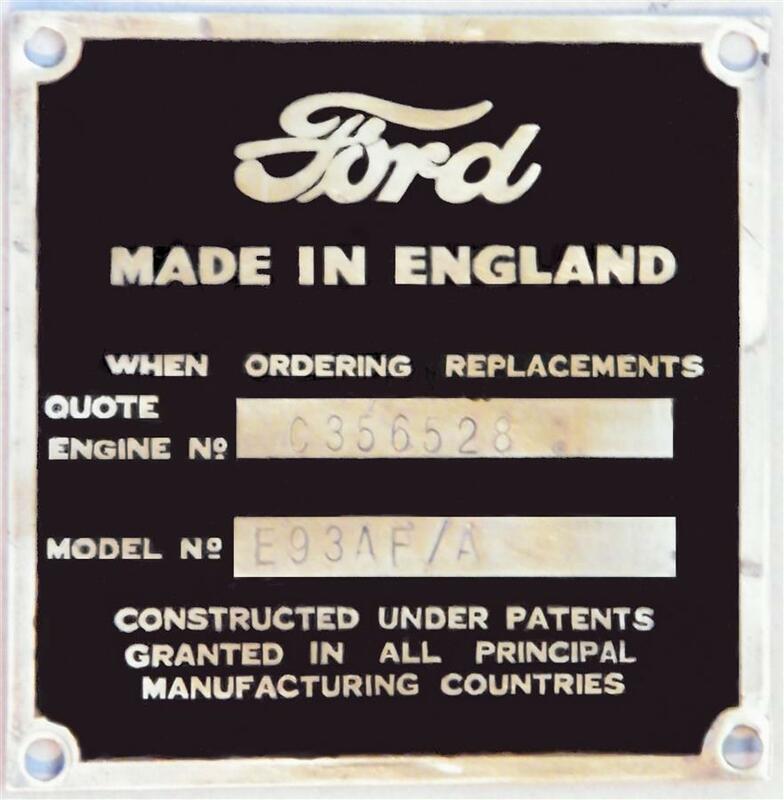 And it never lined up right resulting in early distortion and wear of the cylinder dust cap. Well, maybe I was such at that time. I certainly didn't have much in the way of sophisticated tools. This time I determined to do it right. 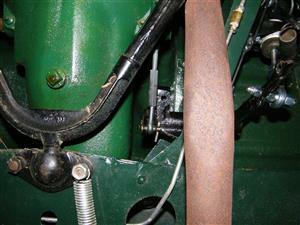 First step was to replace the bent pushrod with a straight rod attached to a pin at the original lever by a heim joint. 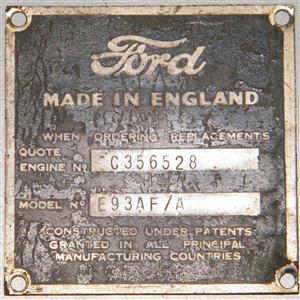 I know, heim joints were probably not used in cars in 1948, certainly not this car. 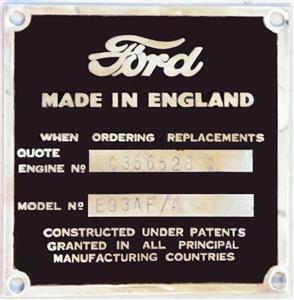 The joint was invented in Germany during WWII though so it was available and could have been used. This car is not strictly original anyway. The left photo is of the new bracket and mount I built. The clamp part is from the original and the rest is new. 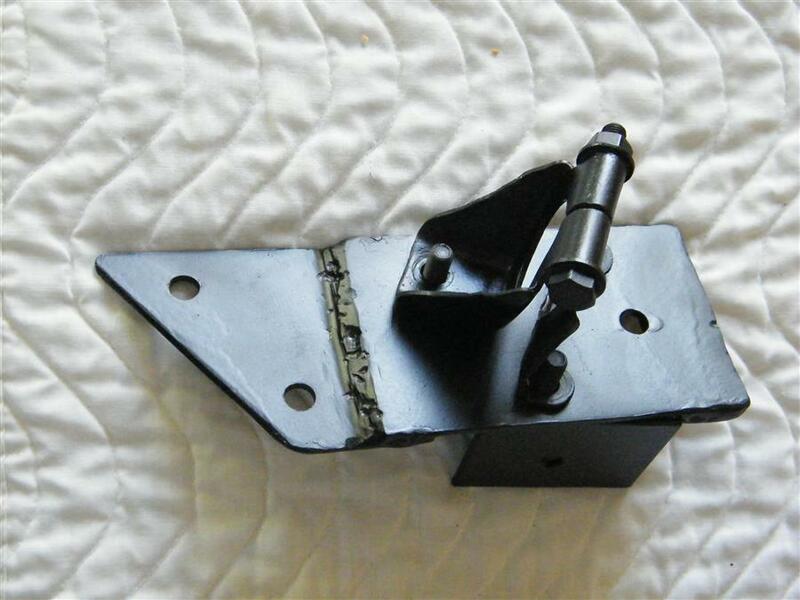 The chassis, where this is mounted has large lightening holes so a backing plate is required for one of the mounting bolts the other two use existing bolts. The left photo above shows the slave cylinder, with its heim joint pushrod, finally installed except the return spring is hanging loose. It operates an original lever that passes motion through the frame rail to another lever on the other side as shown in the next photo. 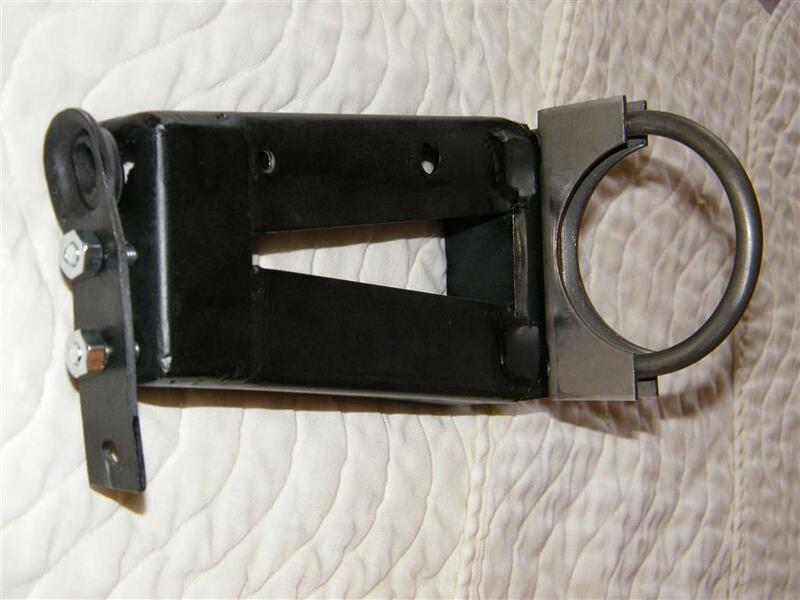 This lever, through the lengthened pull rod, operates the clutch release arm. It all actually works too. The last step of this phase was the hand brake. 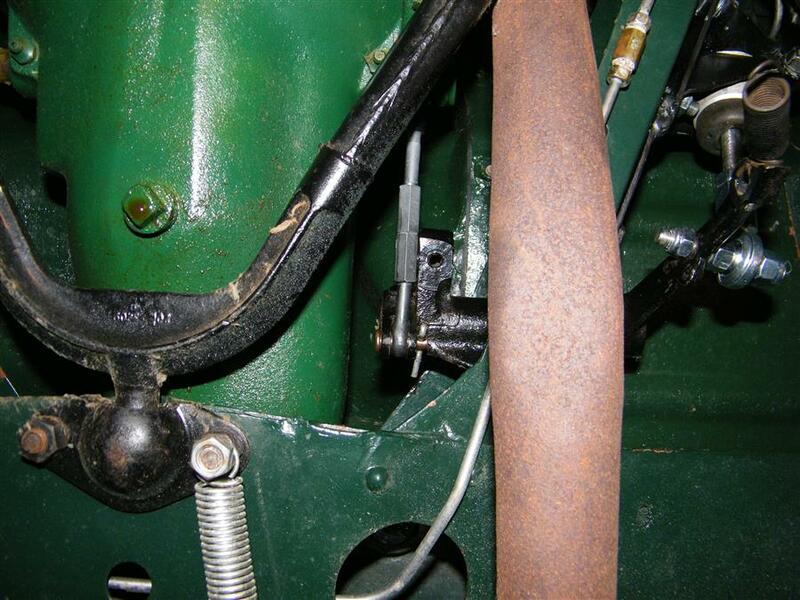 The original hand brake just operated the rear brakes through a slip joint in the mechanical rods and levers. When I stripped the brakes from the '58, I got the cable that it used. 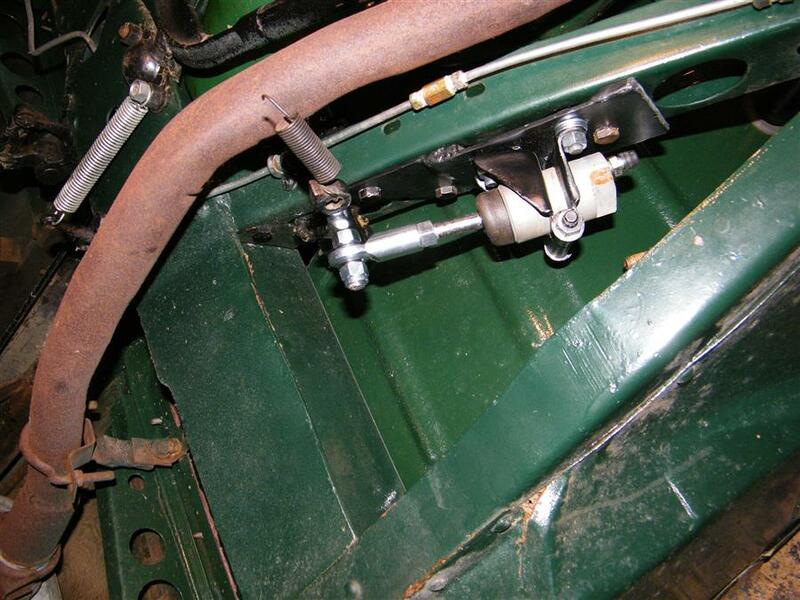 Some time ago, probably before the All British car show, I attempted to weld a bracket for that cable to the bottom of the torque tube and installed the cable to the rear cylinders. It looked good but the first time I pulled the handle, the welds broke. 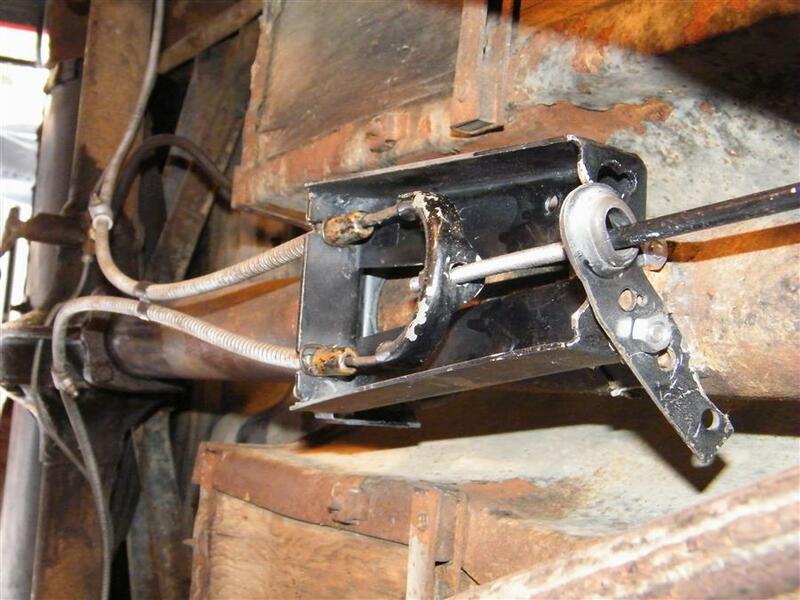 A foot or so forward of my failed weld was a tab factory welded to the torque tube that originally served as a center support for the long rear brake actuating rod. I figured it was strong enough to hold the cable bracket but the cable was not long enough to reach it. The answer was an adapter attached to that tab with the cable retainer at its other end and long enough so the cable would reach. The photo on the left is that adapter. It is made from a couple pieces of an old metal bed frame. The U bolt just fits around the torque tube to stabilize the back end and the front attaches to the torque tab. The piece bolted to the small end is the original center support. The back end is what is left of the original cable retainer. The rod exiting right is the original actuator for the rear brakes, shortened to operate this cable instead. There is one more unrelated piece done. Before painting the engine side of the bulkhead, I removed the black wood door on the nearside of the shelf. It was plywood and in pretty bad shape so I decided to make a new one. The VIN plate was also mounted on that door. It was readable but not very presentable, as shown on the left. I stripped it, polished the shiny parts and repainted the background. The result is as it now appears on the right. Not perfect by any means but certainly a great improvement. A year or two ago, I bought an original hand crank from eBay that, surprisingly, didn't even need paint. I located and installed the proper clips for it that I had saved when I took them off. I decided rather than black paint I would finish the wood door natural. It is finish birch plywood with just marine spar varnish for finish. I installed the VIN plate in its original position on the replacement door and added the crank. Here is the result. That's all for this chapter. I'm not sure what will be next. I'm ready to start the motor and I have a full set of dampers that need to be sent for overhaul. I also have a lot of upholstery I should be doing while the weather does not lend itself to outside work. Then there is the body work that needs done before painting can begin. Well, let's just guess and call it "Make It Run." Meanwhile, I have been working, slowly, on upholstery. We touched on the package shelf, kick panels and draft excluders in the last chapter as they were part of getting that stuff done. The rest of the upholstery I'll keep in a separate chapter as the work is done.